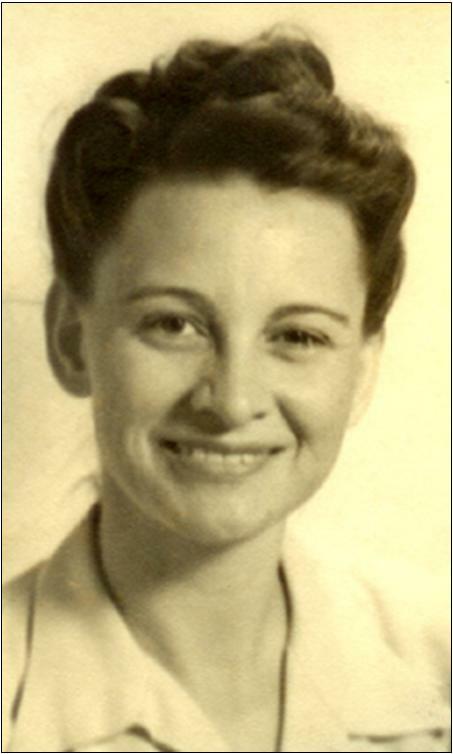 Doris Evelyn Minter was born on 16 March 1915 in Pine Forest, Texas, and her maternal ancestry delineates her as a Daughter of the Republic of Texas. Her great-grandfather, Thomas Fitzhugh Bryarly, owned land in the Republic of Texas as of 1839. Doris' father, Emmett Bascom Minter, was a rancher, dairy farmer, and a cotton planter. Picking cotton was one of Doris' least favorite chores. In the Spring, it was difficult for her to chop the stalks about 6 inches apart then during the fall harvest time, she did not like the way the fuzzy cotton felt while picking it. However, she recalls one time her father promised her a banana if she was able to pick 100 lbs. of cotton. Bananas were expensive to poor farmers as were other tropical fruits in those days. She worked well into dusk to complete her task, and her sister, Elkin Margaret Minter, lit several matches to read the weight from the scales. She has always worked hard to earn her way in life. Doris earned her BS in Home Economics at East Texas State University, Commerce, Texas; she studied at Texas A & I University. and Cornell University (NY); and achieved her Masters at Texas Woman's University, Denton, Texas. Doris has a history of educators in her family. Her ancestors established the Bryarly School in Winchester, Frederick Co, Virginia, and her 2nd great-grandfather is documented as a School Commissioner of the same County beginning in 1836. When the Bryarly's came to Texas they established the Bryarly School in Bryarly, Red River Co, Texas. Doris' mother and two of her aunts taught, two of Doris' sisters and one brother taught, her eldest daughter Margaret taught and had a school named after her in Houston, Texas, and two of her grandchildren have also worked in the teaching profession. Doris taught for 33 years; 12 yrs in five Texas school systems, and 21 years with the Agricultural Extension Service. Doris was permanently certified to teach all grade levels as of 24 August 1945. She was a principal and taught 7th through 10th grades at Lindenau School System, taught Science & Geography at Cuero Junior High-School, taught 1st through 4th grades at Bethel, Texas, taught 5th grade at Travis Elementary School during the day then taught the last period of Home Economics at the High School in Sulphur Springs, Texas, and she taught 4th grade at Robstown, Texas, for the last 6 years of her public education career. After her career in public education, Doris held county, state, and federal positions through the Agricultural Extension Service. She began this work as a County Home Demonstration Agent. This position entailed educating thirteen 4-H Clubs and twelve Home Demonstration Clubs. She taught women about work management, energy conservation, money management, credit, life insurance, savings, consumer education, sewing, refinishing furniture, replacing springs in furniture, making lamp shades, upholstering, cooking, canning, and freezing foods. Doris worked with low income individuals and families as a Home Management Specialist, teaching them about income tax deductions, money, and credit management. Her position as a Resource Management Specialist required her to write publications, articles, host live radio, and television programs to educate other Extension Agents and adults in the community (the Texas A&M Federal Extension Service is now titled the Texas A&M Cooperative Extension). The US Department of Agriculture asked Doris to write a chapter in two Agriculture Year Books (1973 & 1974) printed in Washington, D.C.
Doris has been active in the Bryan/College Station Communities since she moved there in 1959. She has served the following boards and committees: the Texas A&M Federal Extension Service, American Council of Consumer Interests, Association for Consumer Research, Texas Consumer Association, National Home Management Association, American Home Economics Association, Texas Home Economics Association, Houston Area & Brazos County Home Economics Association, The Bryan Chapter of Business & Professional Women (since 1970), Electrical Women's Round Table Inc, Texas A&M Wesley Foundation, was raised and joined the Methodist Church at the age of 10: Officer's Board & Eastern Star since 1946 (held all offices including Assoc. Matron 78-79, two terms as Worthy Matron 79-80 & 87-88, Deputy Grand Matron 82-83), Epsilon Sigma Phi, a founding member of the Texas Kappa Chapter of Phi Sigma Alpha. She has been honored by the World Who's Who of Women (8th - 11th Editions), Who's Who of American Women (2nd & 3rd Editions), Who's Who in the South & Southwest (14th Edition), United States Public Relations Service Who's Who 1975, Who's Who in the United States 1975, Contemporary Notables 1975, Dictionary of International Biography 74-75, & Community Leaders & Noteworthy Americans 75-76 & 76-77.
suffered a fatal stroke and passed away on 8 June 2006. Doris was greatly loved, and well respected by family, friends, and the community. compassion that she brought into our lives. Her memory will be cherished through past experiences, pictures, mementos, and the stories that she shared. Please remember the joys and wonderful times when Doris made a difference in your lives. Those tender heartwarming and cherished memories will hold her spirit near in the promise that my Grandmother will live on. 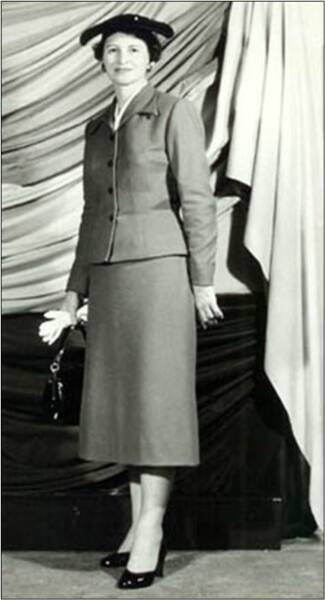 Above: Doris in 1947 when she was a young teacher at Cuero Junior High School. psom162. Right: In 1957 at a Texas Womens University (TWU) fashion show in a suit she made and modeled. psom 163. 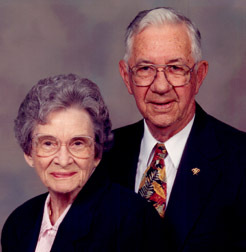 Doris and her husband, Terrell Stewart in 1999.